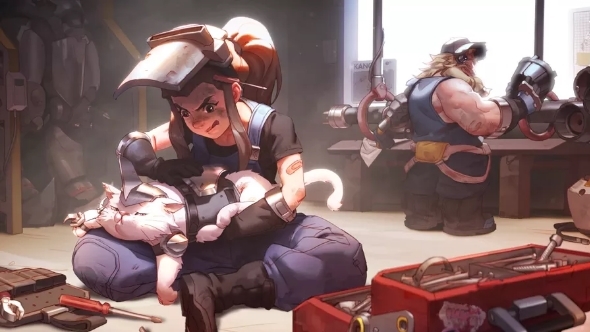 In his video introducing Brigitte, Overwatch’s latest hero, Jeff ‘from the Overwatch team’ Kaplan says that she might shake up the meta in a few interesting ways. The community have been playing around with her on the PTR, and some of streamer Emongg’s followers have clipped some footage that shows just how radical her impact might be. Click here for a rundown of Brigitte’s kit in Overwatch. Dive comps are defined by mobile characters able to pounce on key enemy characters – typically their supports – before they can react, then mopping up the rest of the team once an advantage has been won. Winston is often the linchpin of such comps, thanks to his ability to leap a good distance very quickly and isolate enemy characters from their healers with his bubble. That Brigitte is able to slap him backward and down with a well-placed skill shot is a hard counter to his ability to initiate fights, which is crucial to dive. Tracer is a prime choice of DPS thanks to her agility and fast-charging ult, and Brigitte clearly has a solution to her as well. For everyone complaining that dive has made Overwatch stale: here’s your answer.